One area resident has chosen to honor the memory of her father by embarking on a bicycle ride that will take her from Austin to Anchorage, Alaska. Ria Cho, a 2013 graduate from The Colony High School and current student at The University of Texas at Austin, is working toward being a team member of the 2015 Texas 4000. 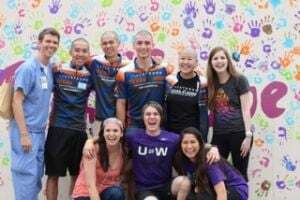 The group makes the 4,500-mile ride as part of its mission to raise money for cancer research. Team members are required to raise at least $4,500. Riders must meet multiple deadlines throughout the year leading up to the ride. By the fall, Cho must raise at least $1,500 to receive her race-issued bicycle. She said she began fundraising in February with a letter-writing campaign to anyone who she thinks will donate toward her goal. In the future, she said there would be a team Facebook page, and she will begin distributing email newsletters. Cho said ideally, she would like to raise at least $8,000. Throughout the ride, team members will make stops to rest and discuss its mission with organizations across the country in an effort to raise awareness and funding. Cho is a novice cyclist – she just learned how to ride a bicycle in the winter, but she is riding for a personal reason. Cho said her father was diagnosed in July 2012 and died June 2013. She said his cancer was in the advanced stages by the time he was diagnosed, but her aunt’s was caught much earlier. In order to prepare for the 70-day ride, Cho will begin training this summer. Cho’s journey with the Texas 4000 began almost a year ago when she first heard about the organization. “I first learned about it through people on campus, and I was interested,” Cho said. In order to be selected for the team, members must complete a lengthy application that address potential riders’ fitness regime and public speaking skills. Cho said it took her two weeks to complete the application. Riders must also complete safety courses and learn how to ride as a group. Team members may ride through one of three routes, the “Rockies,” which runs through Oklahoma, Kansas, Colorado, Wyoming, Montana and into Canada; the “Sierra,” which runs through New Mexico, Arizona, Utah, California, Oregon, Washington and into Canada or the “Ozarks,” which runs through Arkansas, Missouri, Illinois, Wisconsin, Minnesota, North Dakota and into Canada. “We don’t get to decide which route we’ll take yet, but I want the ‘Rockies’ route to visit family,” Cho said. Each day riders will travel between 60 to 100 miles. “At first it was really intimidating, but I’ve just been taking things one day at a time,” Cho said.